Shared hosting usually has the reputation for slow performing websites. Not so with A2 Hosting. A2 Hosting is blazing fast, especially on their ‘Turbo’ plan which is boasted as 20X faster than other hosts. Their plans come with a huge list of features and we’re excited to be able to give you an exclusive coupon, meridian51, that gets you 51% off the first term of any shared A2 Hosting plan. All web hosting companies claim to be the fastest, most reliable, and affordable provider. Obviously, they can’t all be telling the truth and the truth usually comes out in the customer reviews. A2 Hosting has an amazing track record of positive customer reviews, averaging a 4-5 star rating. This is rare for a web hosting provider. A2 Hosting also has a 99.9% uptime guarantee. If your site is down, they’ll provide you with a credit of up to a month’s service. A2 takes security seriously. Their Perpetual Security includes Kernel Care, Dual Web Hosting Firewall, Brute Force Defense, Virus Scanning, Server Hardening, and 24/7/365 Security Monitoring. A2 also provides enhanced WordPress security by giving you a unique WordPress login URL, automatically applying WordPress updates, and adding ReCaptcha to your WordPress login page. A2 Hosting’s main feature is their ‘Turbo’ speed option. If you upgrade to a Turbo plan, your site is hosted on a server with fewer users and the server is optimized for enhanced performance. Many web hosts limit your storage and bandwidth for shared hosting plans, which can make choosing the right plan difficult. A2 Hosting plans put no limits on your storage or bandwidth. Live Chat Support: have your questions answered immediately over live chat. Free Site Transfer:every A2 Hosting plan comes with a free site migration. Free SSL: A2 Hosting provides free SSL certificates for securing your site. Automatic Backups:A2 Hosting keeps your site secure, but for peace of mind, they also provide automatic Server Rewind Backups with their Swift and Turbo plans. A2 Hosting provides many different types of hosting plans including shared hosting, VPS hosting, managed hosting, and more. Lite plan is$3.92/monthand lets you build 1 website with up to 5 databases and 25 email addresses. Resources included on this plan – 2.1Ghz CPU, 0.5GB RAM, and 4GB virtual memory. 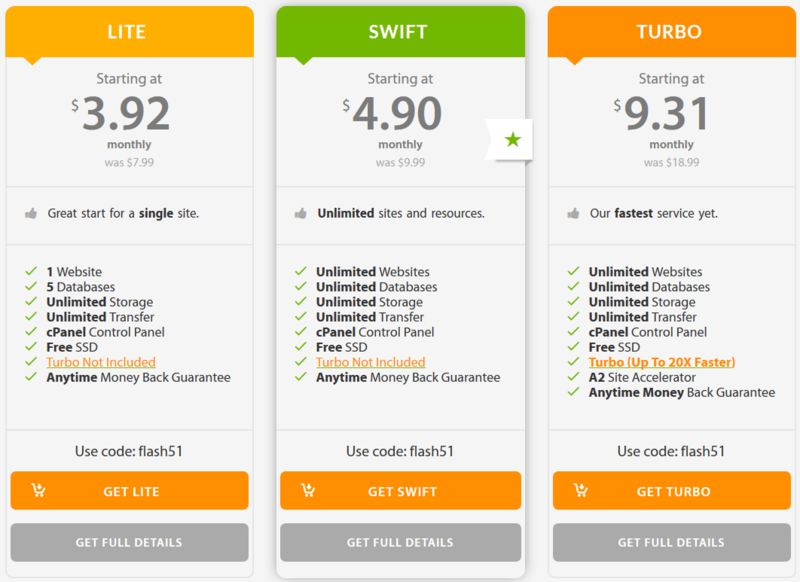 Swift plan is$4.90/month and gives you an unlimited number of websites, databases, and email address. Resources included on this plan –2 x 2.1Ghz CPU, 1GB RAM, and 8GB virtual memory. Turbo plan is$9.31/month and allows you to build an unlimited number of websites, databases, and email addresses.On this plan, your resources include 2 x 2.1Ghz CPU, 2GB RAM, and 8GB virtual memory. You also get the A2 Site Accelerator and Turbo, both of which give you enhanced website performance. A2 Hosting is a fast and reliable web host that has plans to suit anyone, from personal bloggers to small business and start-ups. They are a great choice for any website or WordPress blog and with an anytime money-back guarantee, you’ve got nothing to lose. 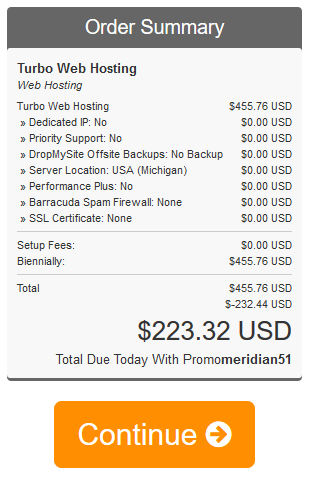 Save yourself some money and use our exclusive coupon – meridian51 -to get 51% off your first plan at A2 Hosting. Use our A2 Hosting link to get 51% off your first plan. All you need to do is follow the instructions below to redeem the coupon and get your discount. Click on this link to go to A2 Hosting. Click on Get Started to choose your level of hosting. Click Get… below the plan you’ve chosen. Choose your domain name – you can choose a new domain name, transfer an existing domain name, update your name servers, or use an A2 Hosting subdomain. Click Check. If your domain is available you’ll be taken to the next screen where you can add extras to your account if you want. Click Continue. Enter in our coupon code (meridian51) in the Promo Code field. Click Validate Code. Complete checkout to add your payment details and purchase your new hosting plan. We've partnered up with A2 Hosting to offer an exclusive 51% discount on all their hosting plans.